ISBoxer.com • View topic - Advanced Video FX: No Holes! Advanced Video FX: No Holes! Note: This guide assumes familiarity with the content of my earlier guide: Managing Video FX with Mapped Keys. Place your Video FX viewers directly in your game windows. There are some good examples of this on the Video FX wiki page. However, duplicating this across all of your windows tends to result in holes in your layout (or a lot of work). 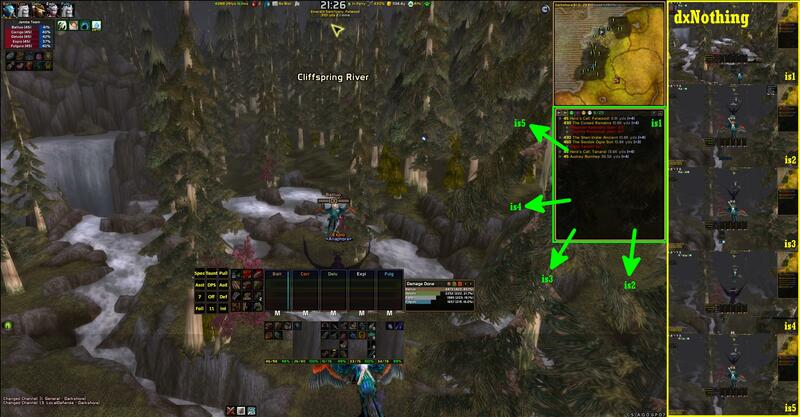 Use a dxNothing window in your Character Set and put all your Video FX viewers there. This is great if you have a lot of screen real estate and don’t mind moving your focus from your main game window. There is a good example of what this looks like on the dxNothing wiki page. The first method lends itself more naturally to use cases like healing, where you only need to view something from a single other window at a time, or when you only ever control things from the same character. The latter method tends to be best when you want to monitor something from all game windows simultaneously or when you swap characters regularly. If you find yourself in a situation where you want to place your Video FX viewers in your game window (either due to a lack of screen real estate or just to have that information easily within view) and you swap characters regularly you have two options: leave a hole and set up your Video FX viewers the same across each window, or do a lot of work to set up a different set of Video FX viewers for each Character Slot and then detect which slot is active. One common example, and the one I will use for this guide, is monitoring quest status on all your Characters. While some games have addons that make this easier a general solution using ISBoxer’s Video FX that does not leave a hole exists and will be demonstrated here. In this screenshot you can see me on my way to Felwood to do some questing. On the right, highlighted in yellow, is a dxNothing window showing my 5 full screen Video FX viewers (is1 through is5). These are always consistently ordered but too small for me to read the quest info. Just to the left of that, highlighted in green, is my quest status window. I would like to be able to press a keyboard key or mouse button and have the quest status windows of my other characters shown in the positions indicated by the green arrows. This is fairly easy to do using Mapped Keys as explained in the guide linked at the top of this post. The problem arises (as seen in this screenshot) when I am playing from the character in slot 2 (is2). If I want to avoid holes, then I don’t need a Video FX viewer for slot 2’s character, instead I need a Video FX viewer for slot 1’s character in that location. In fact, the arrangement of the viewers will be different for each character slot. Now, I could just bite the bullet and create a whole raft of different Mapped Keys which show and hide and move these Video FX viewers depending on which character is active, but that is a lot of work. It turns out that by using a single set of Video FX viewers and varying the Sources of my Video FX using ISBoxer’s Advanced Target Mechanics I can reduce the setup significantly. This guide will explain just that method. Before proceeding, and in order to help in identifying which quest information belongs to which character in later screenshots, I have set up some identifying Click Bars just with the Slot number (see my earlier Guide: Large Character Names in Every Window). Firstly, determine the size and location of your required Video FX Sources and Viewers. Write them down somewhere; you’ll need them later. I always do this using the ISBoxer Control Panel, accessed by default with Ctrl+Alt+Shift+G. This image shows what I want the final result to look like from Slot 1. Create/re-create Video FX Viewers and Sources. I will be creating these Mapped Keys in a Key Map called Video FX, to which I have already added my Character Set. I will also be using an Action Target Group called “Game Windows” which includes all the Characters in my Character Set except the dxNothing Character. The way this will work is that I will use 4 Video FX Sources and 4 Video FX Viewers. The viewers will be static in the sense that they will always refer to the same named source: Quest1 through Quest4. The sources will be dynamic in the sense that the window they refer to will change depending on which window is active. Two Steps, each with 4 Video FX Actions with a Target of Window:Current (self) to Show (in Step 1) and Hide (in Step 2) the Video FX Viewers named Quest1 through Quest 4. You should give this Mapped Key a Hotkey so it can be activated. I use Ctrl+Mouse3. This is where the bulk of the work is done. The first 4 Actions are Video FX Actions that Create the Video FX Sources named Quest1 through Quest4. The Position and Location of each of these are identical as all the quest windows are in the same location in each game window. You wrote the Position and Location down earlier. The next 4 Actions are Video FX Actions that Create the Video FX Viewers named Quest1 through Quest4. While the Size of each Viewer should be the same, they will have 4 different Locations (as determined and written down previously). The final 2 Actions are used to Hide the Video FX Viewers just created. Because Step 2 of my Toggle Quest FX Mapped Key does just that, I can use it. The first Action of these final 2 is a Mapped Key Step Action as shown. The second Action of these final 2 is a Do Mapped Key Action as shown. The final piece of this solution involves activating this Mapped Key every time the active Character changes. Click on Slot 1 in your Character Set and make sure the Switching tab is active. You need to determine whether you are currently doing a Mapped Key when you switch to a Character. In my case (image below) you can see that when I switch to this Character (and indeed every non-dxNothing Character in my Character Set) it performs the JambaMaster Mapped Key in the Control Key Map. Select the Create Quest FX Mapped Key. You would need to do this for each non-dxNothing Character. The result should look like the image below. If there is already a Mapped Key set on the Switching tab, you’ll need to call the Create Quest FX Mapped Key from that other Mapped Key using a Do Mapped Key Action. In my case I need to do that to the JambaMaster Mapped Key in the Control Key Map, as shown below. Now all you need to do is File, Export and test. Here, here and here are some screenshots of the finished product. Last edited by Alge on Mon Aug 12, 2013 8:55 am, edited 1 time in total. Re: Advanced Video FX: No Holes! Another great tutorial alge! would you mind doing a run down of your custom click bars some time? Actually just your UI in general is awesome and I'd love to know what you're using. 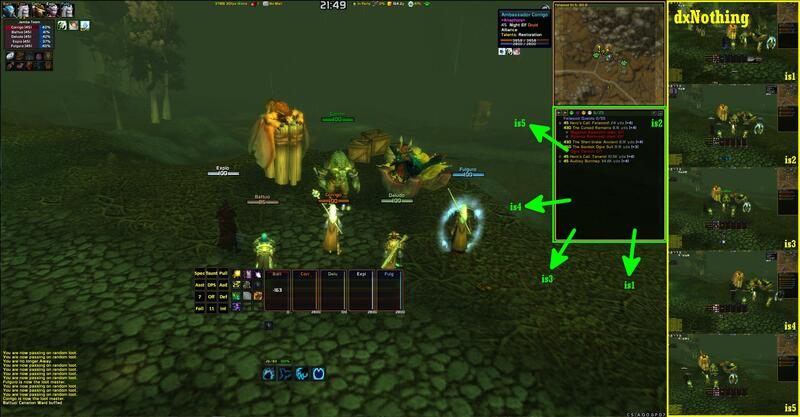 This post talks about those Click Bars and how I handle healing. It's not a full guide but should get you started if you have some familiarity with ISBoxer. 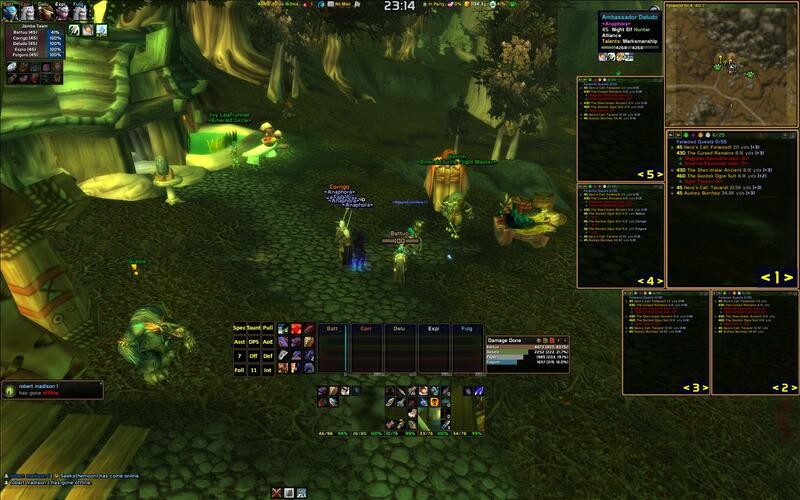 Then I use an LDB display addon (can't even remember which one) and a bunch of small LDB addons. I can do a guide for this if anyone would find it useful....! Thank you so much for the guide. You have been directly responsible for improving my isBoxer experience ten fold. I am now very excited about this and my mind is buzzing with all the possibilities I have thought of for rift and NW. I am unable to get this example to work using (all&other Game Windows)#1 is that command still valid? I R Monk wrote: I am unable to get this example to work using (all&other Game Windows)#1 is that command still valid? Assuming you're putting it in the Target box, and have an Action Target Group called "Game Windows", yes.